The NYSE TICK ($TICK) is the number of stocks trading on upticks minus the number trading on downticks on a high frequency basis. (It's updated about every second on my platform). It's a sensitive measure of market strength and weakness, because it captures the balance between stocks trading strongly (on upticks) or weakly (on downticks) throughout the day. Very often we'll see diminished buying ahead of market tops and vice versa--a useful heads up. Another way of looking at the data is to keep a running total of upticks vs. downticks through the day, similar to an advance/decline line. 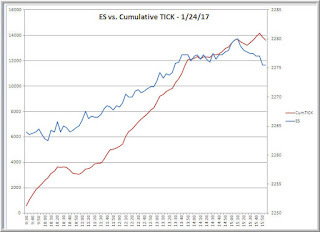 So we're adding the $TICK readings over time and observing changes in buying and selling from the direction and slope of the resulting line. 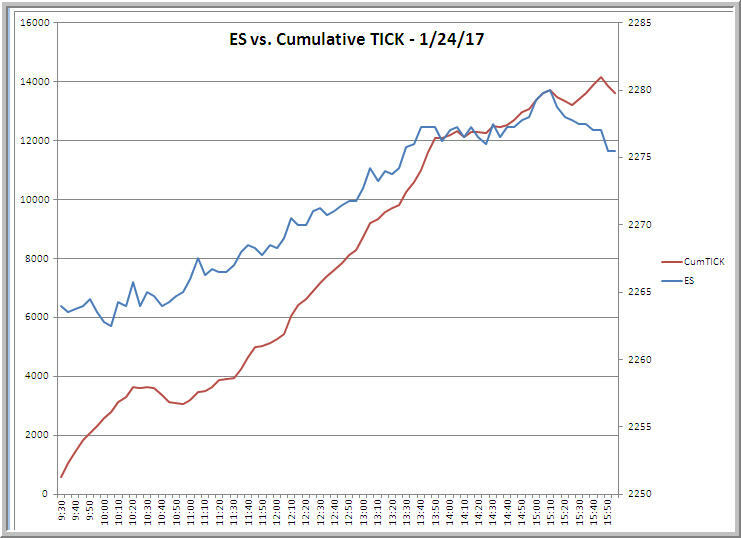 Above we can see the Cumulative TICK line for yesterday, January 24, 2017. Notice how, early in the session, we started with buying interest and steadily moved higher through the day. In other words, buying interest was dominating selling interest right out of the gate. Seeing that lopsided demand/supply situation provides us with useful information to ensure we stay on the right side of the market. Our job as traders is to read market patterns and make decisions accordingly. Our job is not to impose our frameworks on markets and trade in ways that fit our theories (and that will make us look smart). Are you following the market, or are you expecting the market to follow you? Very often, that's the difference between successful and unsuccessful trading.